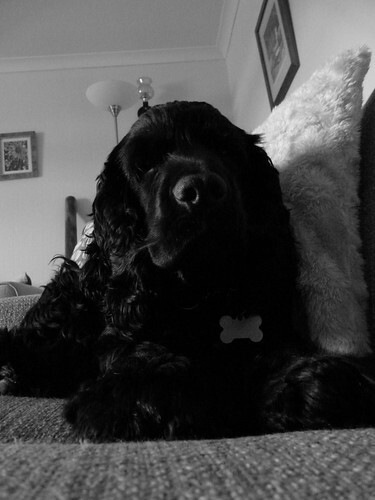 Didn’t think my inky pup would photograph well in monochrome but I quite like these. Especially the first one where he’s attempting to look intimidating! They are great. He is so beautiful. I might try some of my black labs – very difficult to photograph. Pic 1…. ‘You talkin to me?’……..
Marco’s giving your lens his best mean stare! 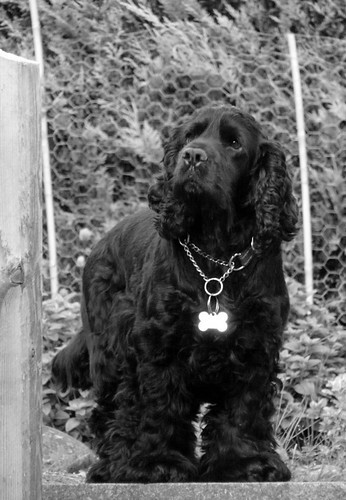 I love the black and white and his shiny name tag. Georgeous pictures of Marco! The colour contrasts are beautiful and there is such a sense of personality! love the last pic! and the shining bone tag makes it quirky and fun. Lovely pictures of your sweetie! 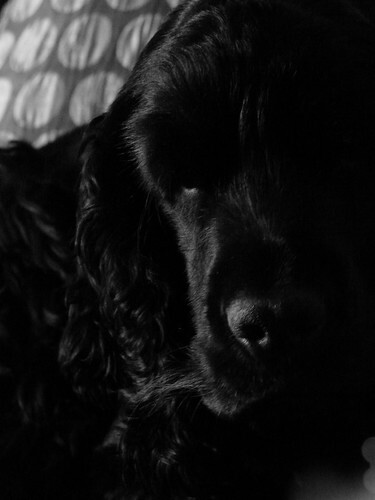 We had a black Cocker growing up that I dearly loved. Your photography is wonderful, anxious to look over the whole blog. Come to Granny Mountain for a visit to Arkansas! Marco has elephant feet! They’re huge! He’s beautiful – lovely photos!